Chances are, you’ve probably never seen a weasel in the wild, but you’re familiar with them through nursery rhymes and story characters. Weasels are often thought of as bad guys and they do have some unsavory habits. They can’t really help it though. They’re just being, well, weasels. All about weasels: tiny mammals that have a long, sleek body and small head. Weasels are rare in North America, but they’re common in Europe and Asia. 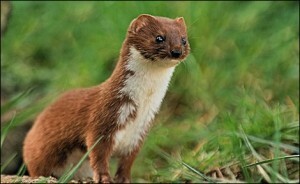 Weasels are rare in North America, but they’re common in Europe and Asia. These tiny mammals have a long, sleek body and small head. They’re perfectly designed hunting machines. Weasels are carnivores and they eat mostly mice and voles. Because they’re small and flexible, they track their prey and go right into its burrow to attack. Most predators are too large to fit in a mouse burrow, but not weasels. They often live in the burrows of animals they’ve killed. 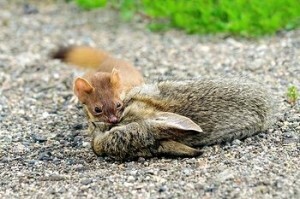 Weasels can kill prey that is much bigger than it, including rabbits and squirrels. Weasels are very small. Adult weasels are only about 7 inches long and weigh between 4 and 7 ounces. Weasels sometimes kill more food than they can eat. Weasels raid chicken coops and eat eggs. Weasels shed their winter fur in the summer for lighter fur. Owls, snakes and dogs and cats all hunt weasels. Weasels will even attack humans if frightened. A video documentary of a stoat weasel hunting for rabbits. Question: How long do weasels live? Answer: Most weasels live no more than two or three years. Male weasels live often live only one year. Answer: Weasels generally avoid humans, but they will attack if scared. They have sharp teeth and claws. Answer: Farmers don’t like weasels because they eat eggs, chickens and even ducks, but weasels also eat hundreds of mice every year. Mice carry disease and eat food crops so weasels are actually helpful. Question: What is the difference between a stoat and a weasel? 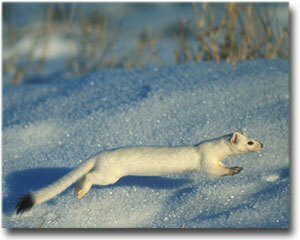 Answer: A stoat is very similar to a weasel but its tail has a black tip. Enjoyed the Easy Science for Kids Website all about Weasels info? Take the FREE & fun all about Weasels quiz and download FREE Weasels worksheet for kids. For lengthy info click here. Declan, Tobin. " Fun Weasel Facts for Kids ." Easy Science for Kids, Apr 2019. Web. 21 Apr 2019. < https://easyscienceforkids.com/all-about-weasels/ >.